The period post Christmas and into January is a difficult time for restaurants. A lot of people, having blown out over the Christmas period, tend to go into financial hibernation. Others inexplicably partake in Dryanuary (my view is drinking booze in moderation throughout the year extirpates the need to abstain at any point during it, with Tryanuary a much better and less pious idea). 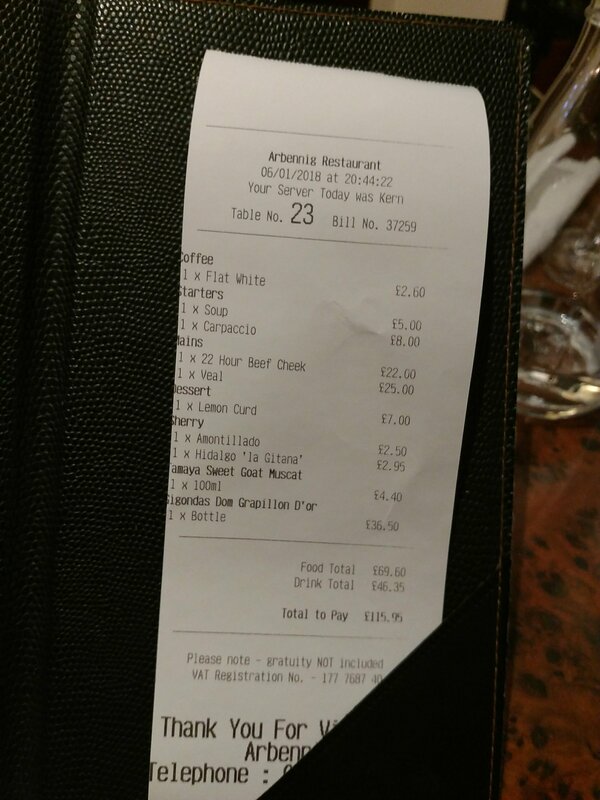 All this puts huge pressure on restaurants who already operate on wafer thin margins – particularly independents who can’t cross subsidise from other parts of the business (or close down a loss making branch) and don’t get me started on the negative impact on the bottom line of no shows (not only rude, but potentially fatal to a business). In Cardiff, we have already seen a number of closures this year (young as it is), including 29 Park Place. In this climate you would expect an independent to baton down the hatches and wait January out by minimising expenditure. This bring me to Arbennig in Pontcanna, a fiercely proud independent whose owner (judging from his Twitter feed) doesn’t appear to be much of a fan of food bloggers. Luckily I (as a very amateurish blogger) fly well below the radar of most in the Cardiff restaurant community, so went without fear for my life. Being rubbish (with the degree of anonymity that brings) has its advantages 😀. In the post Christmas financial Armageddon period, what Arbennig did went some way to rekindle my much jaded faith in humankind. Rather than financially hunker down, the staff and owners of this restaurant give up a hard earned day off on the Thursday after Christmas (if workers in any profession need time off post Christmas it is those in hospitality – they work hours, anti social one at that, which would make most of us blanche) to cook and distribute (with assistance from some marvelous people who volunteered and the butcher Martin Player who on an unsolicited basis donated the meat – I was regrettably working that day which was surprisingly and rather distressingly very busy) 180 hot meals to homeless people in Cardiff. Warms the heart doesn’t it. Lots in press about M&S buggering up their attempt at goodwill, but zilch re this as far as a cursory look by me at the local press (is the Wales Online website a sadistic joke by the webmaster – have they not paid her/him – or is it suppose to be like that, as it makes me want to stab the screen) could tell. Bad news sells I suppose! 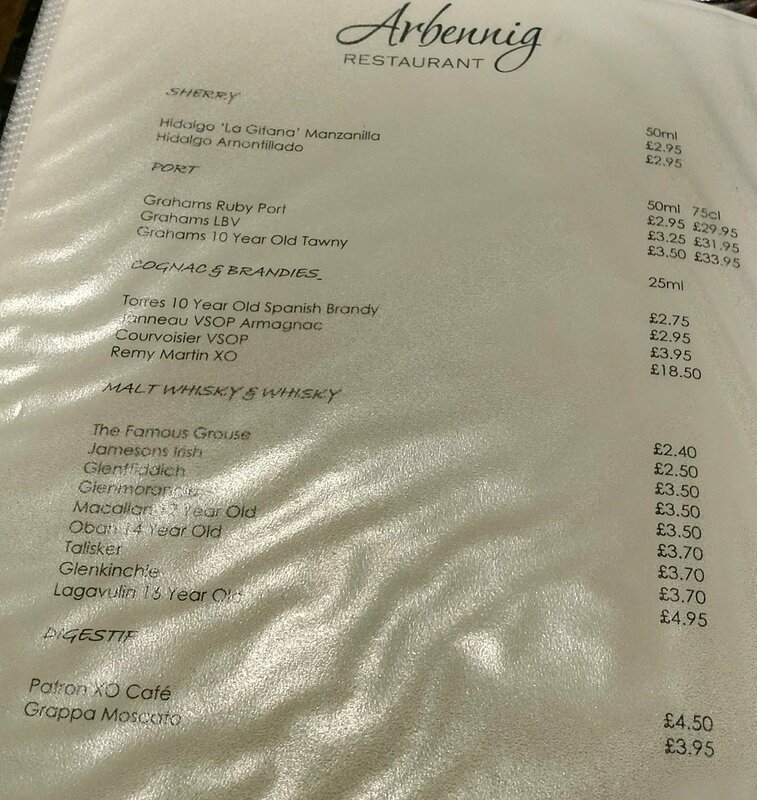 The staff and owners of Arbennig (Special in Welsh) on this basis are clearly a special set of people. The question, therefore, is just how special is what is on offer in their restaurant. This I found out on my visit in darkest, dankest, January, on a date night with Mrs. SF (who else would it be I hear you ask, which is a point well made). Both outside and in it is an inviting sort of place. Not fussy but nicely understated. 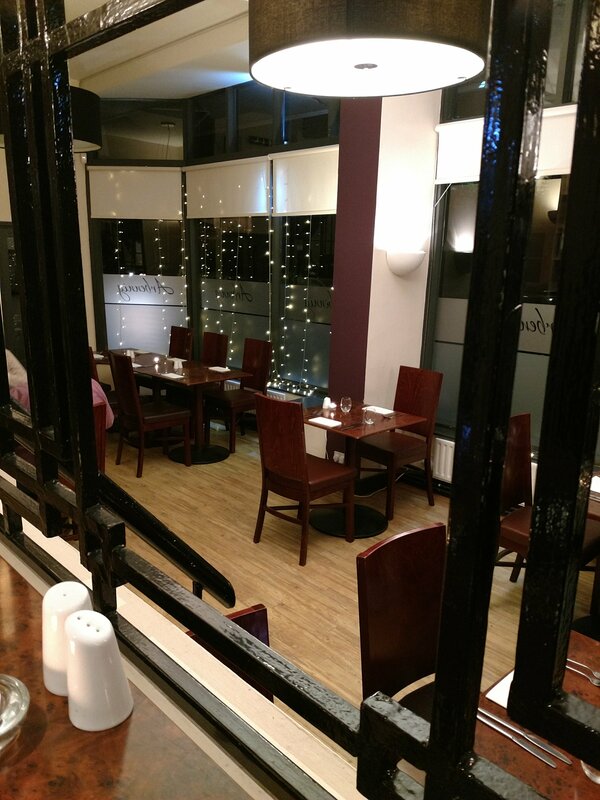 The set up inside is quite higgledy piggledy, which creates some nice semi – private dining areas. Must be a bloody nightmare for the waiting staff mind – with stairs down from the kitchen to the main dining area to negotiate. The dinner menu is not too long, with 6 starter and 7 mains. I like short menus as it indicates a kitchen that likes to concentrate on doing a few things well. Notwithstanding the relative brevity of the menu, the stuff on it made choosing hard. On the starter front, I was tore between the octopus (love it when done properly, so it is butter knife tender) and the Welsh beef carpaccio (a dish that lives or dies on the quality of the beef used). Pretty as a picture, this was a nicely balanced dish with the all important beef being of top notch quality. 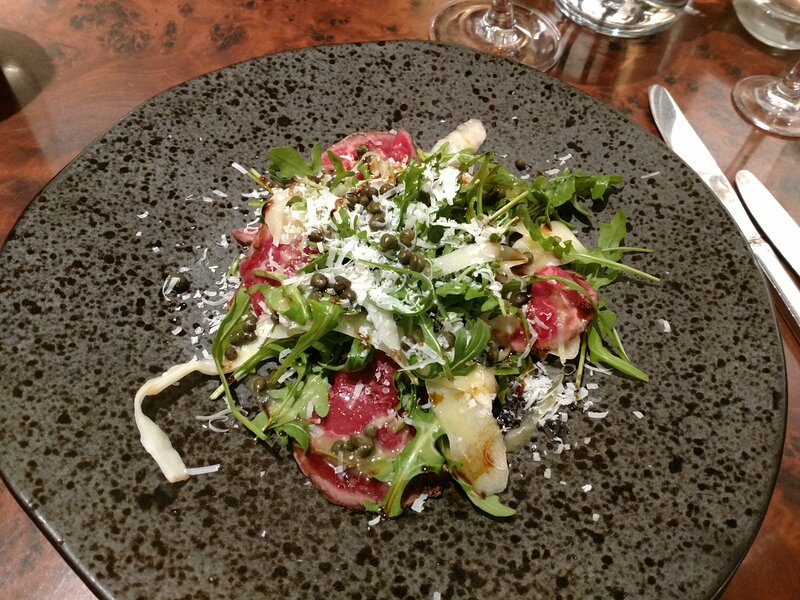 Umami rich parmesan, peppery rocket and briney cured green peppercorns worked very well with the beef. Root vegetable ribbons added nicely on both the flavour and texture front. A very good starter dish I thought. 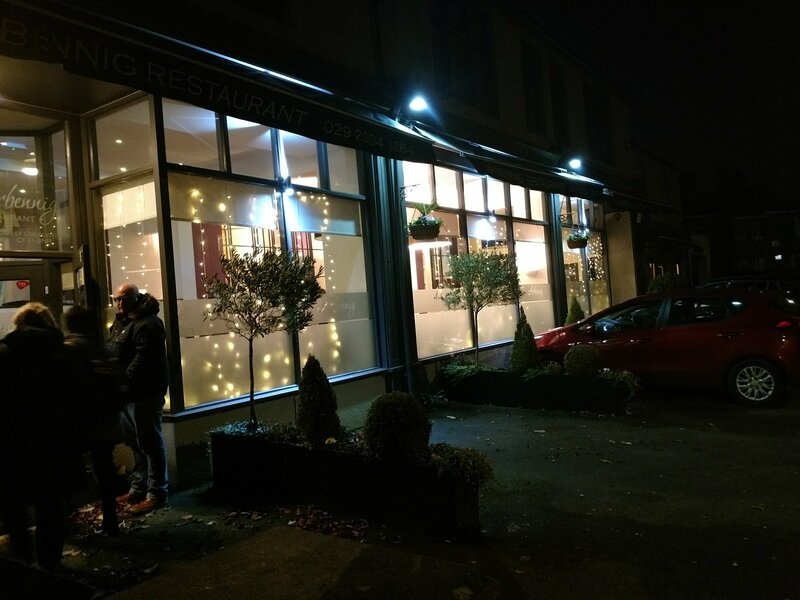 It was a chilly night and, as we had (rather virtuously) walked to the restaurant (from our Llandaff base), Mrs. SF felt the need for something warming. 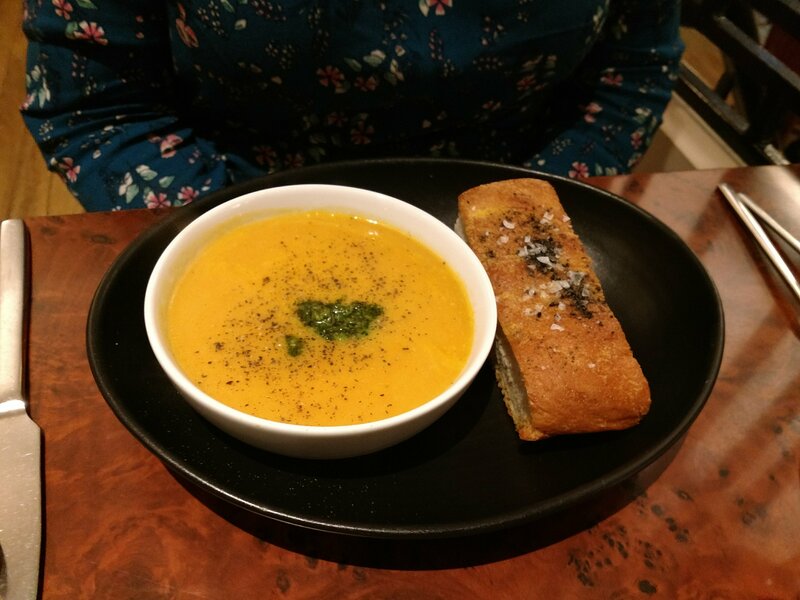 As a result she had the winter vegetable (predominately squash I would say) soup (£5). Nicely flavoured and seasoned soup this, with a dollop of a very pleasing pesto added to it. It came with some absolutely lovely focaccia of which I probably eat half on the pretence of wanting a little bit to try. On to the mains, as far as I was concerned, there was never any doubt in my mind as to what I was going to order. My reaction on seeing on a menu anything coming from Illtud Dunsford (of Charcutier Limited fame) is to order it immediately. To me the provenance of meat is really important (one of the reasons I tend to avoid chains like Jamie Oliver’s is doubts, well founded it seems, on this front) and you don’t get much better than stuff from Mr. Dunsford. Nothing I have eaten from him and his wife has been anything short of bloody marvellous (currently becoming somewhat obsessed with their marvelous black pudding). 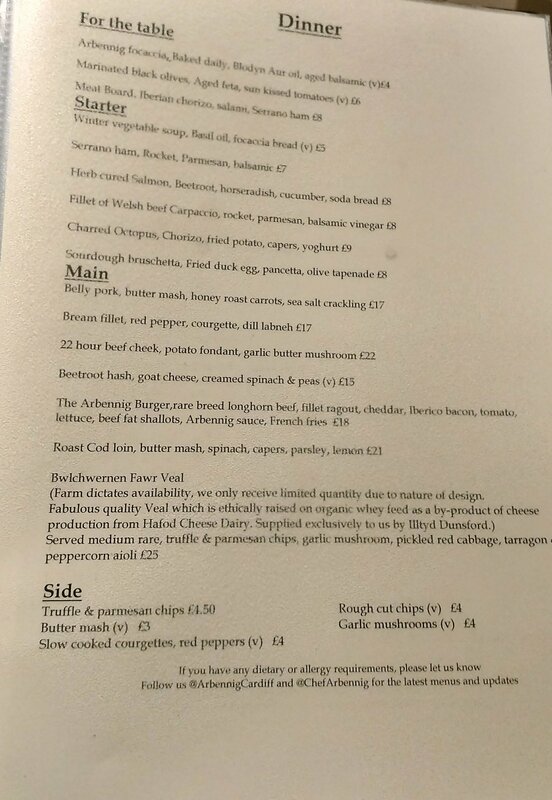 It was, therefore, an absolute no brainer for me in terms of choosing, for my main course, the rose veal (£25) – which is feed on the whey by-product from the very good Hafod cheese dairy (keeping it all nicely local). This (as I knew it would be) was a stunningly good piece of meat and the kitchen here had treated it very much with the respect it deserves. Nicely seared on the outside, it was a perfect pink on the inside and jam-packed full of flavour. Just lovely. The accompaniments sensibly operated to emphasise the meat rather than overawe it. 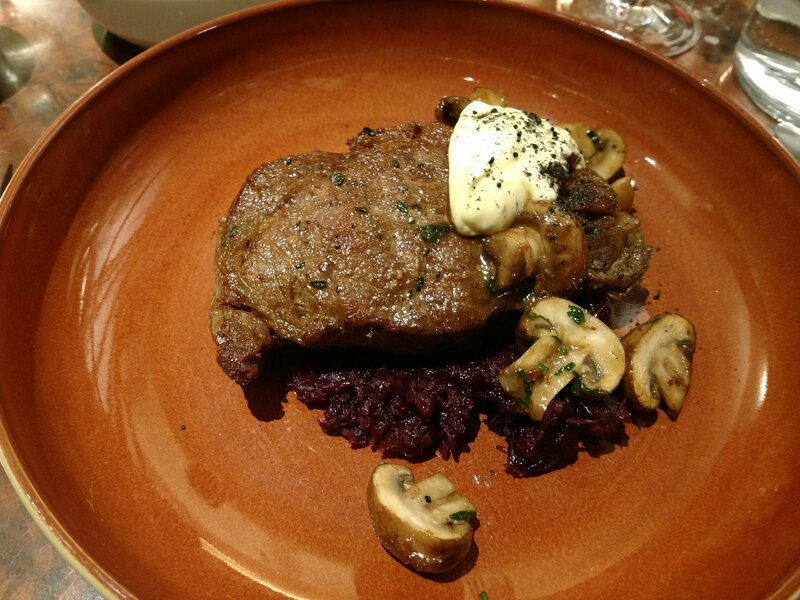 Earthy chestnut mushrooms came with a pleasing hit of garlic and the nicely spiced red cabbage (to remind you of Christmas past) operated as a pleasant counterpoint to the rich veal. The tarragon and peppercorn aioli rounded things off nicely. Everything on my plate was perfectly seasoned. This bring me to the final accompaniment, in the form of a bowl of parmesan and truffle chips. Dear Lord these were good – quite possibly the best chips I have ever come across. Triple cooked, they were fantastically crisp and crunchy on the outside and super soft and fluffy on the inside. 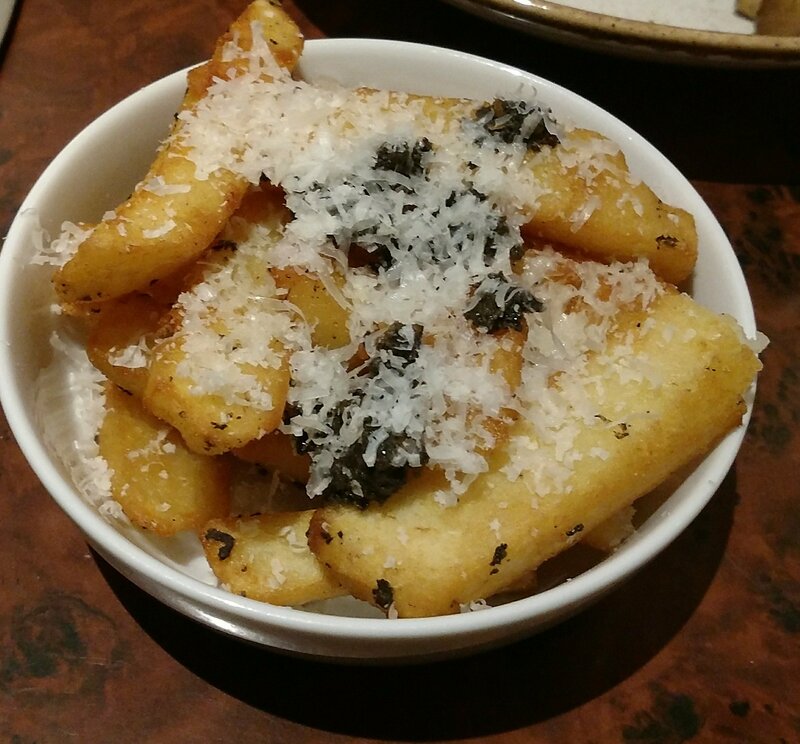 Stunningly good on their own, they came showered in finely grated parmesan and globules of truffle paste. 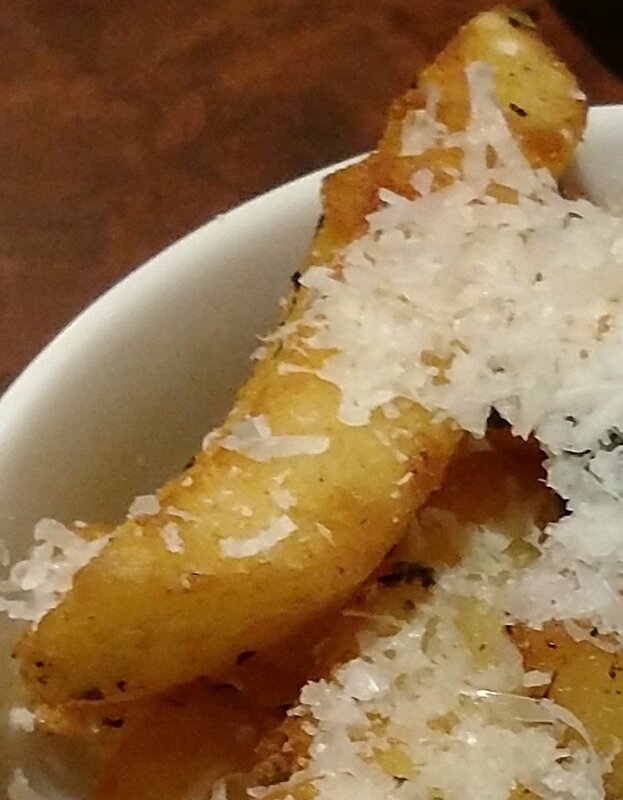 The umaminess of the parmesan and the rich earthiness of the truffle worked a treat with these fat beauties. Kudos to the chef who cooked these – they were stonkingly good and are a very early entrant onto my list of the “Best Soliciting (flavours) 2018”. 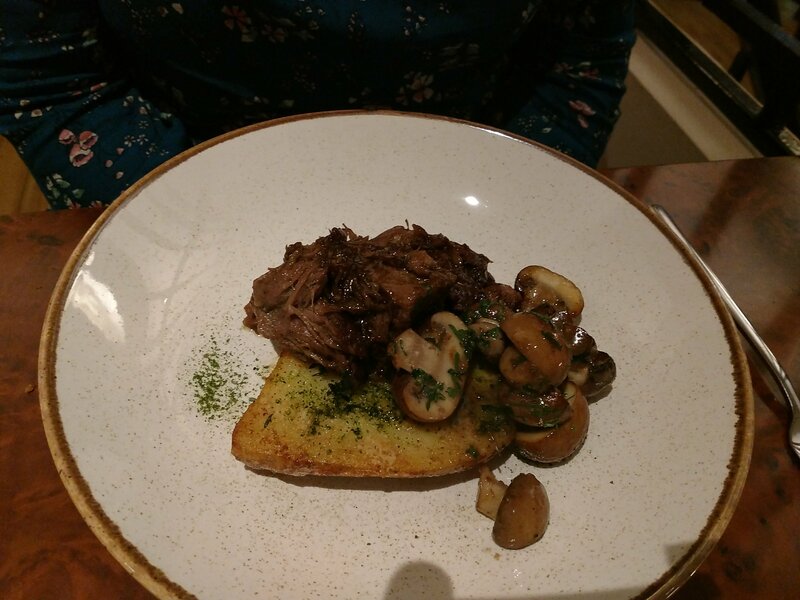 Mrs. SF went for another winter warmer in the form of the 22 hour beef cheek (£22). 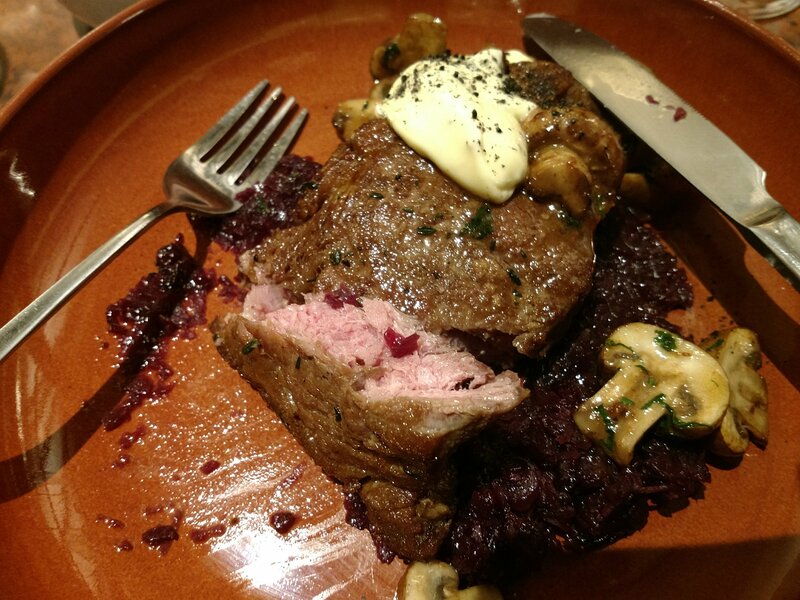 A beautifully flavoured and fall apart tender piece of meat, with a nicely cooked fondant potato (so easy to bugger these up) and the same garlic infused chestnut mushrooms as came with my veal. Only possibly quibble (and it was a mighty minor one), with this dish, was it could have perhaps benefited from just a tad more of the braising liquor coming with it. Super dish nonetheless, which Mrs SF very much enjoyed. Both Mr. SF and I were nicely sated at this point so decided to share a dessert. 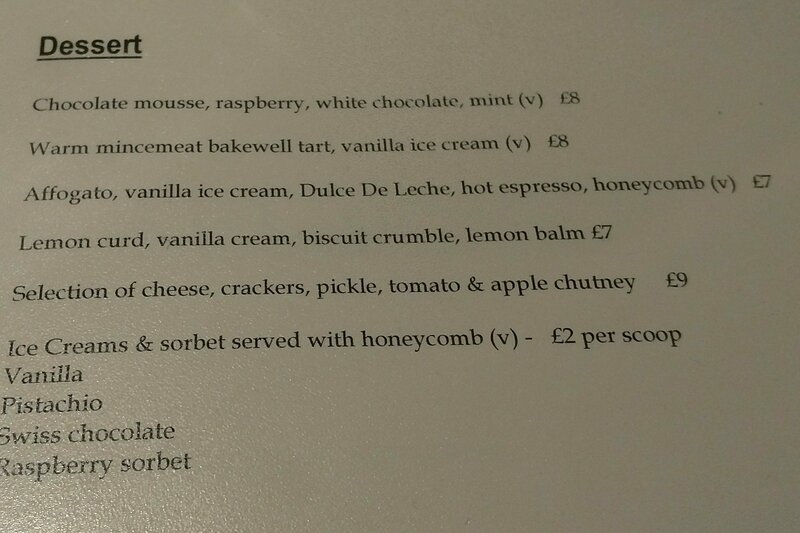 Whilst tempted by the Affogato (which was positively flying out of the kitchen), we decided on the lemon curd number (£7). Nice balance of flavours and textures here, with varying degrees of lemoniness from the curd and the lemon balm scattered on top. 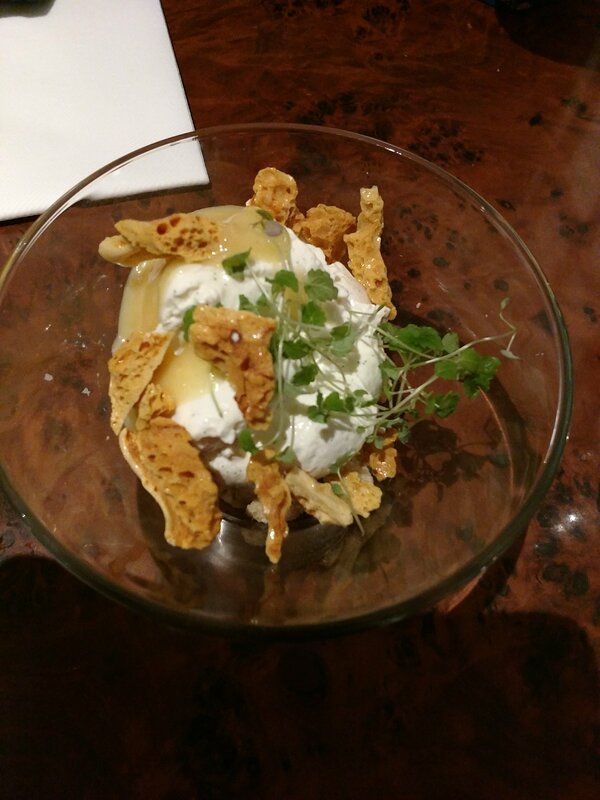 I particularly liked the honeycomb (am a total sucker for a good honeycomb), which had a nice chewiness to it. On the booze front, joy of joy, there were two sherries on the list from a very decent producer in the form of Sanlucar’s Bodegas Hidalgo La Gitana . Sherry makes a fine apperitif and Mrs. SF and I happily sipped on a Manzanilla (Mrs. SF) and an Amontillado (me) as we awaited our starters. My only issue with the sherry was it came in tiny dolls house glasses (with the measures a mere 50cl). In my view sherries (other than the real sticky stuff perhaps) should be drunk like any other wine – in a proper sized glass and with a proper (i.e. 125ml) measure. I think this is the sort of glass sherry, particularly Fino or Manzanilla, should be served in. Why people serve it in dinky glasses and measures is beyond me. 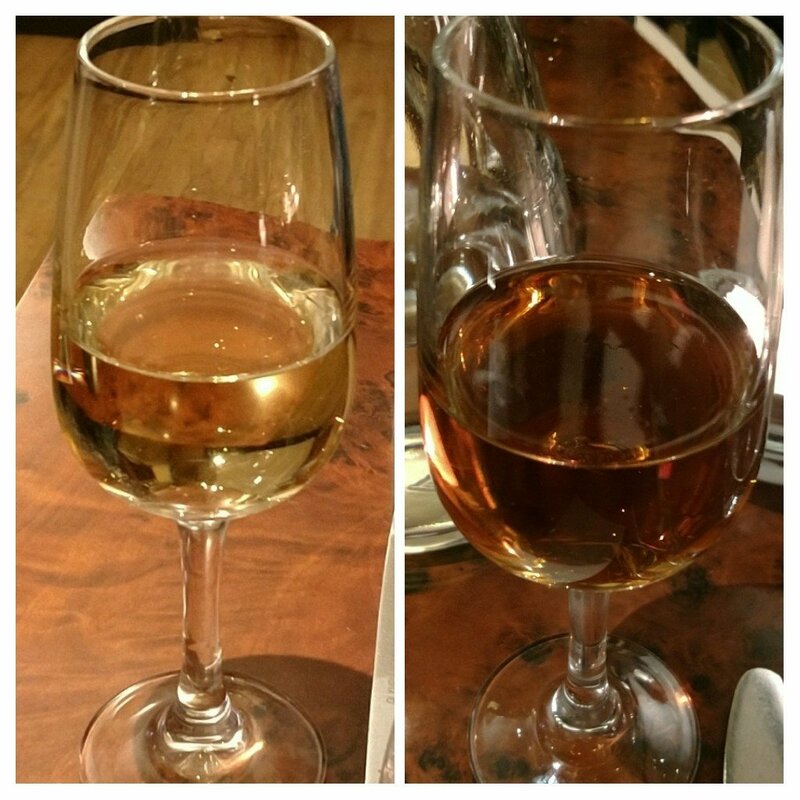 In terms of the price, at first sight the £2.95 for the Manzanilla and the Amontillado looked very attractive (odd that the Amontillado is on the list at the same price as the Manzanilla as it generally retails at a higher price than the Manzanilla). 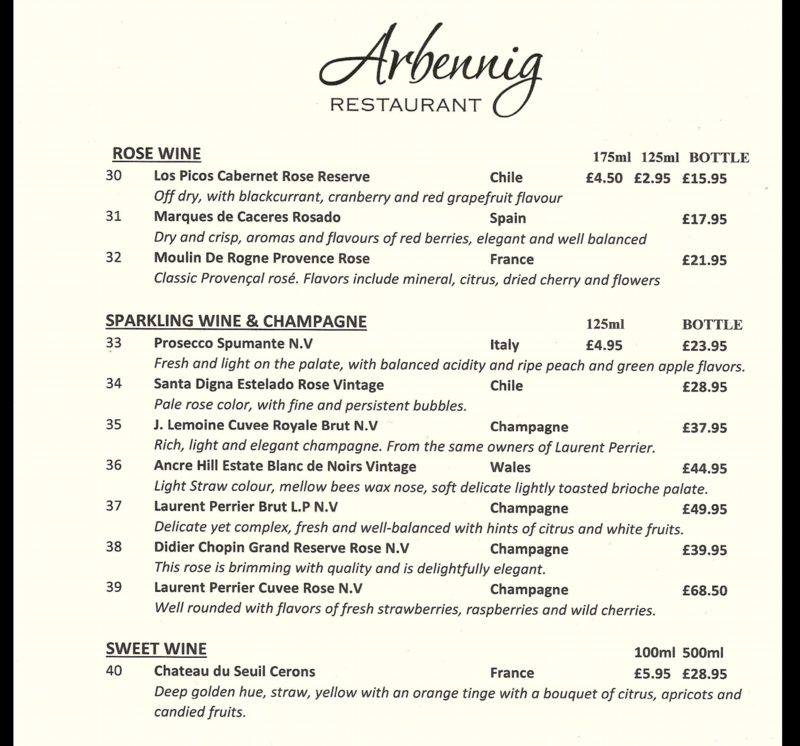 The 50ml, however, equates to 10 measures and thus £29.95 for a 50cl bottle. 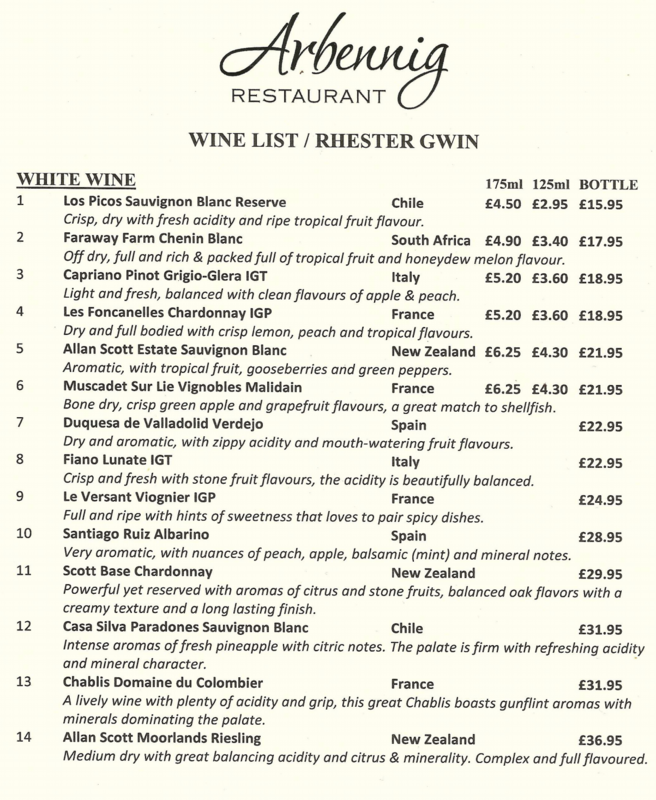 I can get a 50cl of the Manzanilla on the list here for £6.99 retail, so that is quite a steep mark up. I suspect that, with the Manzanilla, the price is due to the fact that once opened it does not keep very long at all, so unless you have a reasonable turnover of the wine a lot goes to waste (can always use it in the kitchen mind). Not so much the case with Amontillado though (which keeps much longer once opened). This is all a bit chicken and egg though, as if you don’t sell much then you need to price it to reflect the wastage, which in turn risks not selling much. Bigger measures would address this at least in part as that would, in theory, lead to quicker finishing off of individual bottles. Elsewhere on the list the mark ups are actually quite reasonable so the pricing of the Manzanilla is a bit out of kilter. The list has a short, but reasonable selection of wines. On the white front is nice to see more than just the usual suspects, with the whites including a Fiano, a NZ Riesling, a nicely priced Viognier and (that much underrated of whites) a muscadat. Shame nothing from the Alsace or Germany (an Alsace or Mosel Riesling would be a nice addition) or from a bit further East (perhaps an Austrian Grüner Veltliner – a fantastic food wine – or a Hungarian dry furmint, again a good food wine). 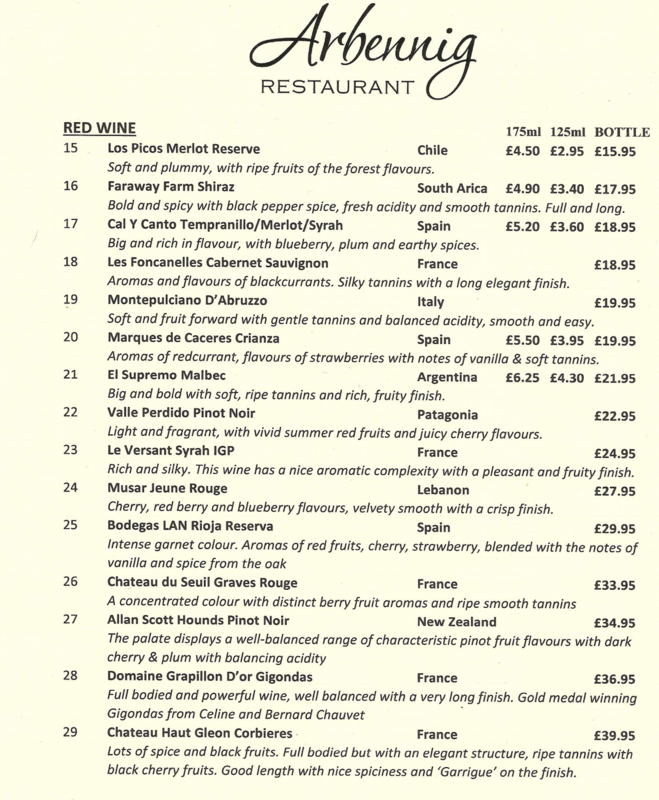 The list has a short, but perfectly nice, selection of reasonably priced red wines (the Lebanese Musar Jeune Rouge on the list here is a whopping £12 cheaper than it is on the list at Marco Pierre White’s Steakhouse in the City Centre). Nice to see a couple of pinot noirs on the list, including one from Patagonia. Some stuff from Australia (odd there is not a single Aussie red on the list – a good Barossa Valley Shiraz – would be fab with the beef cheek) and perhaps some Portguese reds (very underrated and currently excellent value) would add nicely to the list. Italy (a country with so much diversity on the wine front) also seems a little unrepresented in the red department, with just a Montepulciano D’Abruzza. Nice gutsy Southern Rhone number, with bags of red berry fruit and a pleasant spicy kick (think black pepper). 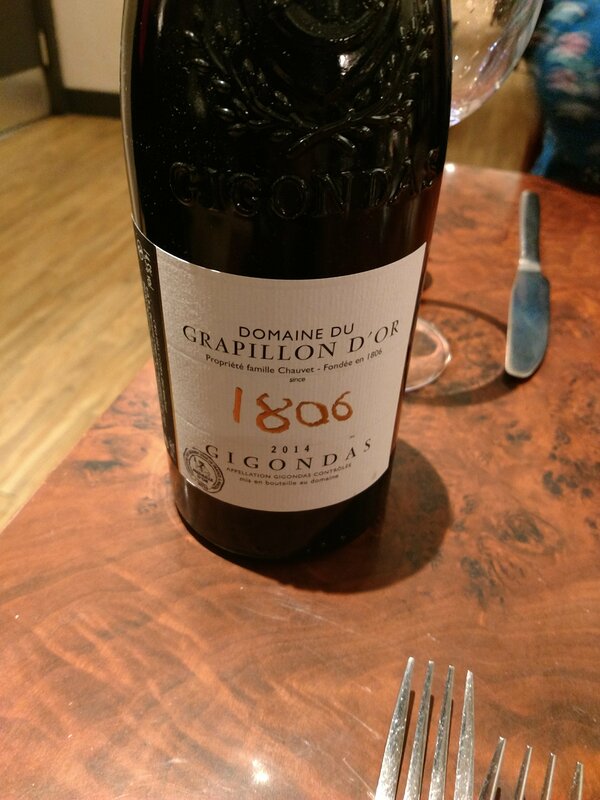 A very pleasant drop, which worked a treat with our mains. I choose the latter in the form of a glass (100ml for £5.95, a 50cl bottle is £28.95) a sémillon base Bordeaux (Cerons appellation) wine from Chateau du Seuil. This was again fairly priced, with it retailing at £15 for a 50cl bottle. Nicely delicate apricot and candied fruit notes from this wine, with a touch of citrus acidity. It paired very well with the lemon curd dessert. Mrs. SF finished off proceedings with a jumbo sized flat white (which she said was very nice). I really like Arbennig. Great food from a kitchen that clearly knows what it is doing in terms of both sourcing (serious brownie points for getting the veal from Illtud Dunsford) and cooking the excellent ingredients it sources. Service was nicely paced, engaging (but not overbearing) and knowledgeable in terms of the menu items. Little things pleased, like the bringing of a jug of tap water to the table unprompted, and knowing about the wine. In short, well trained staff, who were more than deserving of the tip given. On the price front (sans a tip) it came to just over £115. Based on the booze we had and the quality of the ingredients and cooking I thought this a very fair price. They also do a set price lunch, which looks excellent value at £14.95 for two courses. It is always nice to support local independent businesses and with one’s this good it really is a no brainer. Would I go back? Oh yes – they do the best chips I have come across in a very, very long time and to paraphrase many a Jewish comedian, ” There here for most of the week, try the veal”. Not a huge fan of the up and coming Valentine’s Day, but understand how much of a financial filip it must be for restaurants and what could be more apt for dinner that night than a cracking bit of “rose” veal? If it is on the menu for that night it could even tempted an old misery like me out. Address: 6- 10 Romilly Crescent, Pontcanna, Cardiff, CF1 9NR. I assume this is on the site of the old Le Galois? It is – was Oscars for a bit after Le Galois closed then became this place. Been there a while now. 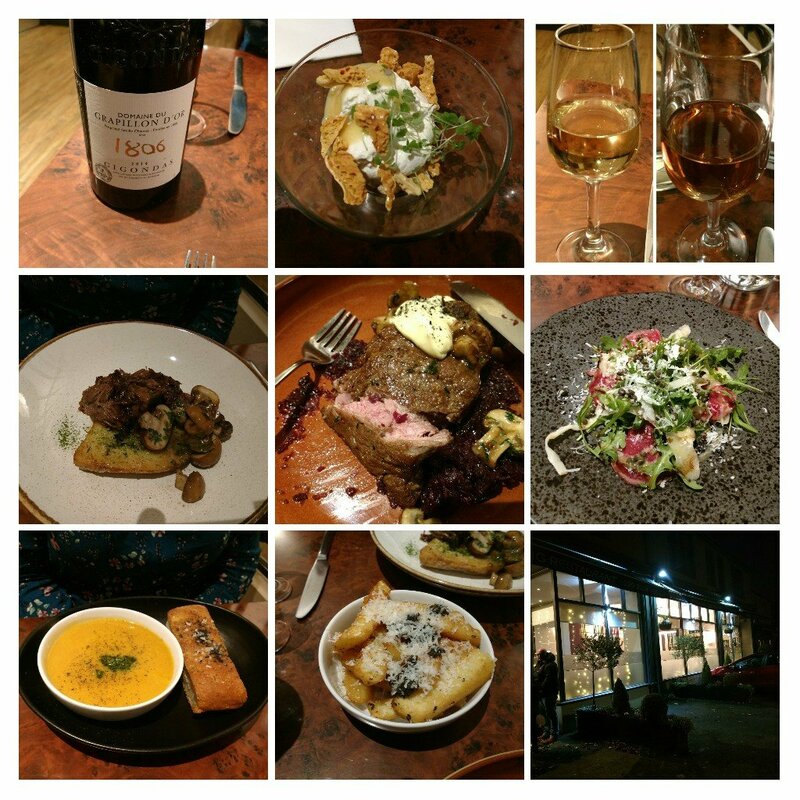 This entry was posted on Jan 28, 2018 by solicitingflavours in albarino, Alcoholic drink, Alternatives to sauvignon blanc, Arbennig, Australian wine, Austrian Wine, beef, Bierzo, bistro, Burger, burgers, Cardiff, Cardiff restaurant, charcuturie, cheese, Chilean wine, coffee, desserts, Drink, Dry aged beef, Dry white wine, Fine dining, fish, Food, Food and wine products, France, French wine, Furmint, German wine, Gruner Veltliner, Hungarian wine, Ice cream, Lebanese wine, manzanilla, Marco Pierre White, Mencia, Muscadet, Pinot Noir, Pontcanna, Portuguese wine, Red Wine, restaurant review, review, Rhone, Riesling, Rioja, seafood, Sherry, Spain, Spanish wine, steak, sweet wine, Tempranillo, Tokaji, Uncategorized, veal, viognier, Wales, Welsh wines, Wine, wine mark up, wine pairings.